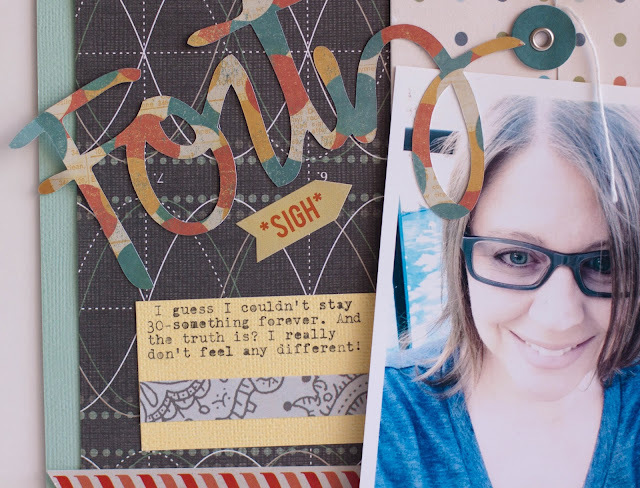 Scrapbook Circle's June kit First Avenue features a bunch of the fabulous Basic Grey Collection Hipster. I LOVE this collection. But it is truly the way the kit incorporates other elements that makes it AMAZING to work with. Like the Farmhouse paper.And the Jillibean Soup alphas. I also got the Add On this month. And that only makes the whole experience even more perfect. Add in the Bella Blvd washi. And the Fancy Pants envelopes. SIGH. LOVE LOVE LOVE. It was one of those sit down and delve in and get lost in all the goodness kind of kits. Yeah, so I turn the big 4-0 this month. Not super thrilled. But I think for the most part I am handling it ok. Pretty much ignoring it for the most part (with a side of denial to round it out). But it wouldnt be a big birthday without a big celebration. So I am collecting fun scrappy goodness for a nice big box to send someone. Keep on the lookout. Anywho back to the kit.... HOLY cuteness, how awesome are the Basic Grey chipboard shapes? And see the Rock On circle? THAT my friends is from the Scrapbook Circle printable. It used it a TON this month! OH and the flair???!!! 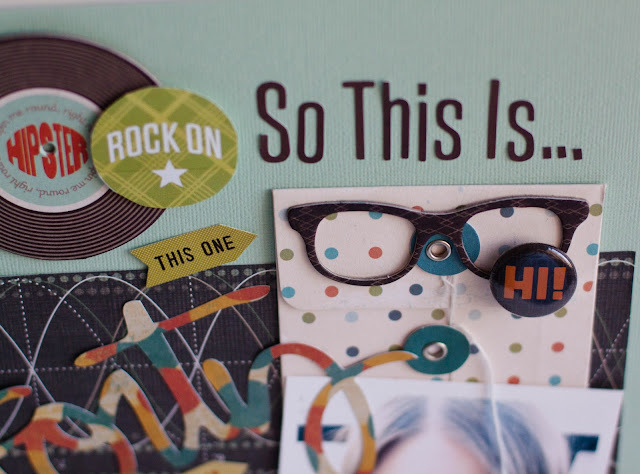 Made exclusively for this Scrapbook Circle Kit and PUUUURFECT designs and colors. And the stickers? A whole sheet of Basic Grey elements stickers. And that cool border on the journaling was the Fancy Pants Swagger border stickers. I am telling you, SUCH a cool combination of product. I kind of have a feeling these kits are going to sell out, so run over and snap one up now if you are interested. Happy Birthday... and yep, on the lookout for the box of goodness. Love the title. Just love it. Happy Birthday!!! 40?!?!? 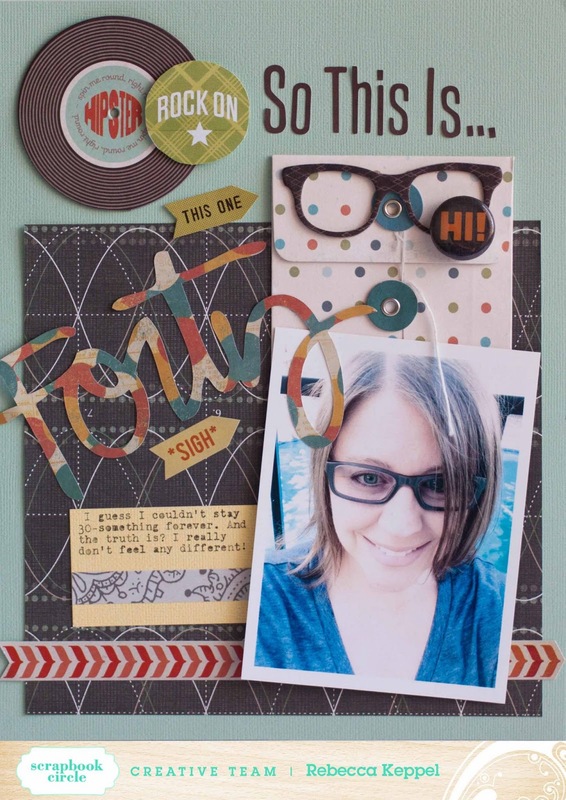 You look AH-MAZ-ING as does your super fun layout!!! I'll be 40 in 2 1/2 years! Yikes! seriously those glasses look unreal! Loving these pages! Hope turing 40 goes smoothly! looking good at 40 my friend! Happy Birthday!! LOVING this page! YOU LOOK AMAZING for 40 :) LOVE your layout! You have such a unique style, I always love all your layouts! wht a perfect LO! you are most definitely fabulous at 40! looove this kit. I may just very well go buy it.